Sandwich always make a quick and tasty food!! Perfect for breakfast or even lunch box!! Yummy share!! Grilled Zucchini sandwich sounds delicious, Harini. Never tried that combo so far and i love this kind of simple yet yummy cheese & veggie combo sandwich. My kind of sandwich for sure!!! I haven't tried zucchini in sandwiches. This is a great find by your daughter. 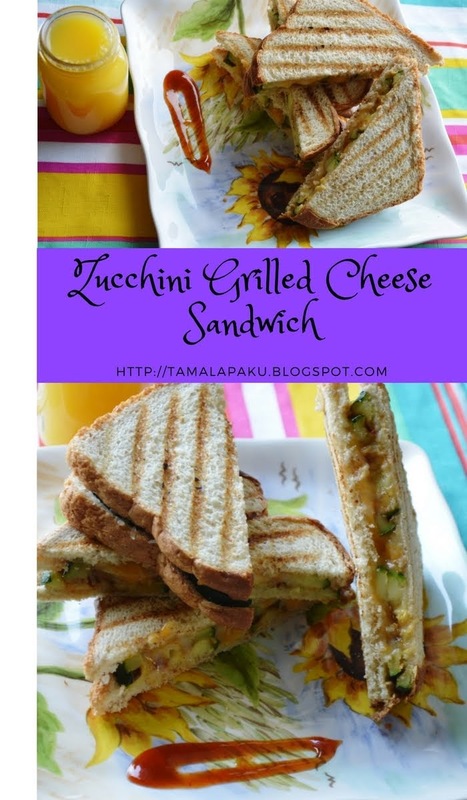 The sandwich looks so good..
Have tried Zucchini sandwich but not with cheese, this sandwich sounds very interesting and prefect to pack in kid's lunch box without any hesitation. Haven't tried cheese - zucchini combo in a sandwich. Sounds interesting. I've on occasions had grilled zucchini in sandwiches when I'v eaten them out somewhere, but beats me as to why I haven't made them at home. Your simple sandwich with zucchini and cheese looks delicious. Packing sandwich for lunch is always a tricky thing right, will try this for my kiddo, and so nice your daughter gives you ideas on what she wants. Surely makes life so easy! I love the idea of adding veggies to grilled cheese sandwich. Thanks for the tip on toasting bread before assembling the sandwich. Looks awesome. Wow, that's a brilliant idea of adding some zucchini to cheese sandwich !! They look so delicious, So nice of your daughter to suggest making these sandwiches.. You have shared some wonderful tips kudos!! Zucchini in a sandwich with cheese must have been so unique but I guess it is a nice way to feed kids zucchini. As with cheese it would taste so delicious that they won't even realize. My boys love zucchini and they would love this grilled cheese with zucchini for lunch box. Thanks for the tips to make the sandwich less soggy. I will try this recipe as I still have a couple of Zucchini left in the fridge. My kids love sandwiches and I am planning to make this for them. Healthy and yummy sandwich for kids lunchbox.. Lovely idea.